https://www.facebook.com/photo.php?fbid=786072168087454&set=pb.147086321986045.-2207520000.1393061600.&type=3&theater for the whole medal haul photo!! The final day of competition for me in the Masters Games, thank goodness. It has been a tiring week. Four 2:5 hour drives, work in between, and 9 races in 5 days. 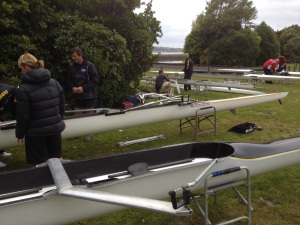 Today was regatta day.